Three SNRE graduate students will defend their theses and a dissertation in early November. 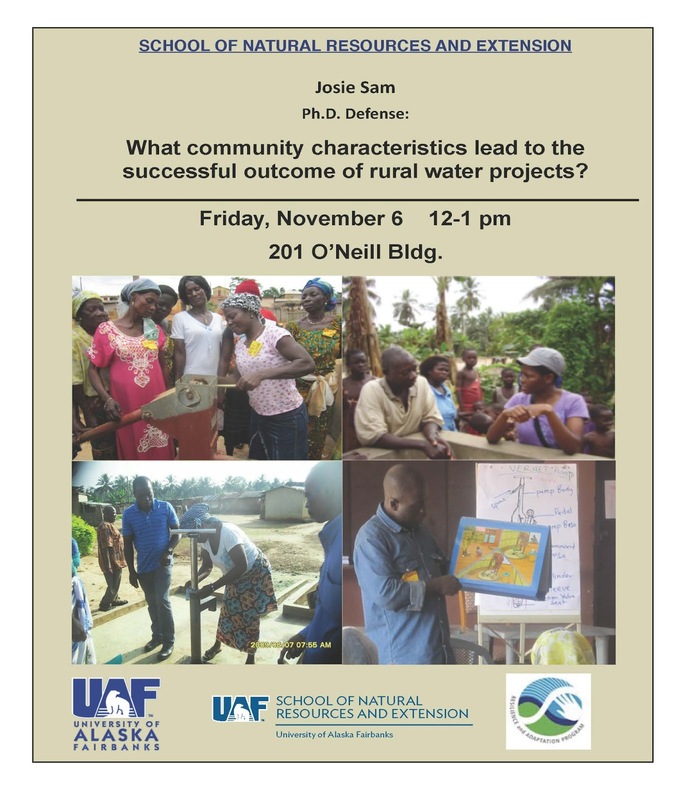 Josie Sam, a Ph.D. candidate in natural resources and sustainability, will defend her dissertation, titled “What community characteristics lead to the successful outcome of rural water projects?” at noon Nov. 6 in 201 O’Neill. Sam is from Ghana and spent time there while studying models for sustainable water projects in developing countries. She has been a student at UAF since 2009 and earned a master’s degree here. Her advisor is Associate Professor Susan Todd. Willie Wilkins and Brooke McDavid will defend their theses for a Master’s of Science in natural resource management. Wilkins will make his presentation at 1 p.m. Nov. 4 in 183 Arctic Health Research Building. Wilkins served in Malawi with the Peace Corps and his thesis is titled, "An Impact Assessment of Current Rural Alaskan Village Solid Waste Management Systems: A Case Study." McDavid participated in the Peace Corps Master’s International Program in Fiji. 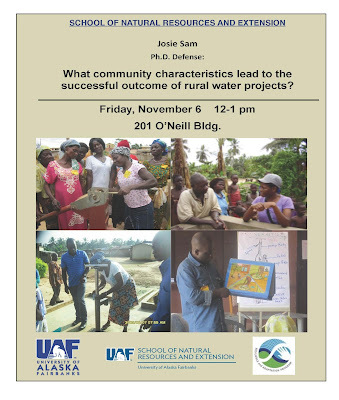 She will defend her thesis at noon Nov. 9 in 201 O’Neill. It is titled, “How can participatory social network analysis contribute to community-led natural resources management?” The thesis is a case study from Bua Province, Fiji.